What is Hot Air Blower? Hot Air Blower is a tool or equipment that blows hot air for desoldering (removing) and soldering of SMD (Surface Mount Devices or Electronic Components) or IC from the PCB of a Mobile Cell Phone or any other PCB. 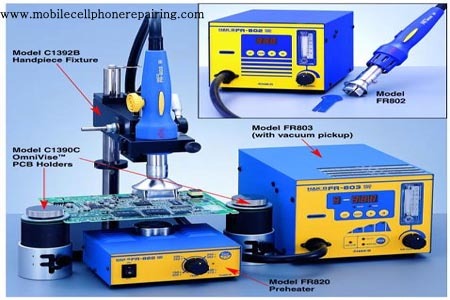 It is also called SMD (Surface Mount Device) rework system and SMD repair system. It has control to regulate or manage temperature and flow or hot air. Temperature settings range from 200 to 500 Degree Celsius. How Does a Hot Air Blower Work? A hot air blower machine is divided into 2 parts – a station with all the controls to set temperature and air flow and a hand piece to release hot air. There is a heating element or heater coil (generally made up of ceramic) inside the hand piece. Cold air flows from the station to the hand piece and when this cold air comes in contact with the heater, the air gets hot depending on the temperature setting and hot air blows out. How to Solder or Desolder IC and other SMD Electronic Components Using a Hot Air SMD Rework Machine? Set the temperature and air flow at the required setting. Make sure the temperature is neither too high nor too low. A temperature of 400 Degree Celsius is good for most soldering and desoldering work. Also make sure that the air flow setting matches the temperature setting. Proper air and temperature settings are mentioned in the manual of the machine. Identify the faulty IC and gradually give hot air to the component. Start by giving heat from some height and then gradually decrease the height. This will prevent the PCB and other electronic components from getting damaged due to thermal shock. When the solder paste is melt, remove the faulty IC using a Tweezer or IC Pick Up Tool. Clean the track properly. Use desoldering braid if required to remove all the solder paste from the track. Dispense fresh solder paste on the track and place the NEW IC. Give heat starting from some height and gradually decreasing the height of the handpiece of the hot air blower. When the solder is melted, remove the blower and the NEW IC is soldered. Tips: Apply good quality NO-Clean Liquid Flux before desoldering and soldering. Which is the Best Hot Air Blower Machine? There are many manufacturers, exporters and suppliers of Hot Air Blower Machine. Well known among them are Hakko, Weller, Goots and Bosch. Many Chinese companies also manufacture and sell cheap hot air blower machines but they compromise with quality. I trust Hakko and Weller. Please visit http://www.pcbatools.com and send an Enquiry. I need phone tools. How do I apply for it? I like these tools. And am interested in them. You can Buy these Tools from PCBA Tools. Just search on Google and You will find at TOP. Plz is it soldering n dissoldering can the bower do in phone repairs? Yes, a blower can do both soldering and desoldering if you use solder paste. can u please get me the Gas blower type? Buy the Baku Brand. It is economical and good. It will cost you from Rs. 1000 to Rs. 80,000/- It depends which brand and model you select to buy.